Welcome to this month's edition of the Poppins Book Nook Virtual Book Club for Kids! May's theme is Caldecott Medal Winners. The Caldecott Medal has been awarded annually since 1938 to the artist of the most distinguished American picture book for children. This gave us an amazing array of wonderful books to choose from! We finally picked the 2003 Caldecott Medal Winner My Friend Rabbit by Eric Rohmann, and we came up with a fun activity to go with it! My Friend Rabbit is a gorgeous book that my kids love. It's narrated by Mouse, who tells of his friend Rabbit and how he always gets into trouble, making several other animals angry in the process! One of the things that I love about this book is that it has several wordless pages, which really allow my kids to use their imaginations and their own words to tell the story. The center page of My Friend Rabbit is one of these wordless pages, and my boys love to get out their toy animals and match them with the animals on the page. 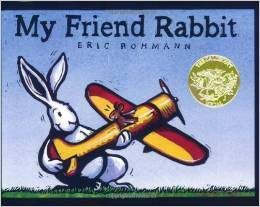 In the story, Rabbit gets into trouble when his toy plane gets stuck in a tree, and he enlists the help of several animals to try to get it out. We decided to make a couple of planes of our own and see if we could make them fly into the tree in our yard. To make our planes, we used our 100 Paper Planes to Fold and Fly book. I love this book! Each page is a decorated plane, with lines showing where to fold. There's directions in the front too, so it's really easy to follow. Trust me, if me and 2 toddlers can do it anyone can! Once our planes were ready, we took them outside to see if they would fly. They worked great! It was a windy day, but we finally got one stuck in our tree, just like Rabbit! Then my boys wanted to be lifted up just like Mouse to rescue the plane. Then it was time to fly some more! 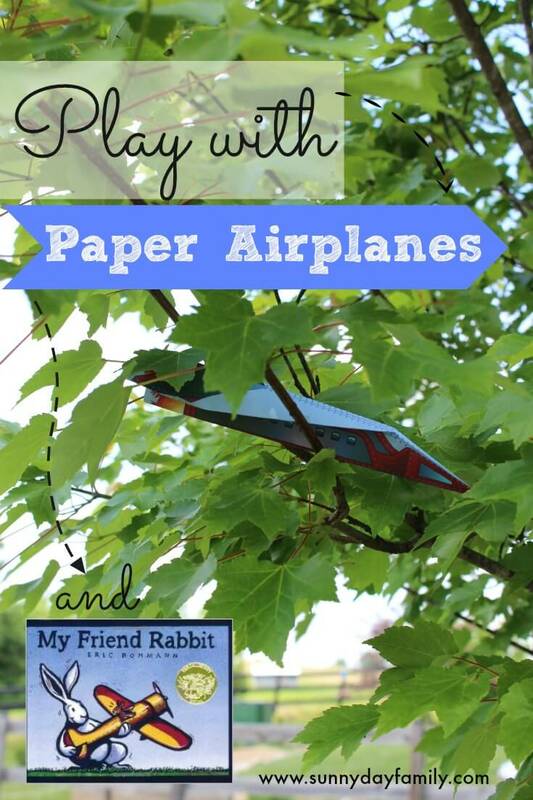 We love My Friend Rabbit and making and flying our own paper planes really made the story come to life. It was a great backyard activity which got my kids moving and having fun! Our 100 Paper Planes to Fold & Fly book made making the planes easy and fun too. We'll have to check this book out! Love your airplane activities, thanks for great ideas! I have to check this book out for my son. He loves paper airplanes!! This looks like a really neat story book and a cool activity book too! I'll have to check them both out! Thanks for linking up at the Thoughtful Spot! That paper airplane book looks very cool; definitely something my youngest would love! Thank you for sharing at Inspire Me Wednesday. Featuring you in this week's issue.